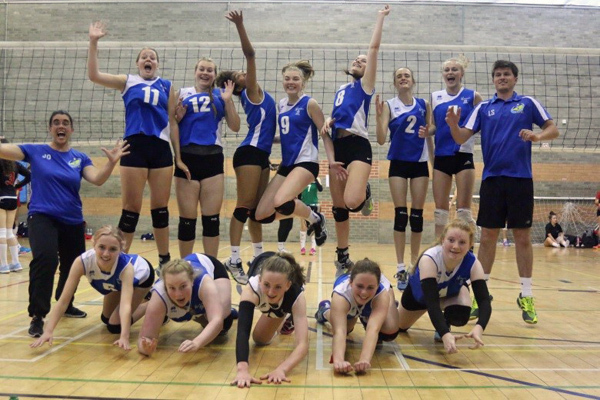 On the Friday 25th May we travelled down to Kettering in the evening ready to play volleyball for the weekend. After arriving about 8:30 at the hotel we had a quick team meeting after the other bus arrived and then went to bed ready to play the next day. On Saturday we were up early, getting ready to get to the National Volleyball centre. We had a busy day that together as a team we played well against some really good teams. After a long days volleyball we headed to the restaurant where everyone was very hungry! After a fairly long wait for our food once we had eaten everyone was ready for bed. On Sunday, we knew that we would be facing the two toughest teams that like us at that point unbeaten. By the end of the weekend we had won 4 games and lost 2 and that left us in 3rd place overall. It has been a great experience and working as a team with some very talented volleyball players was definitely a bonus. A massive thank you to everyone in the South West squad who helped in getting us to Kettering and playing volleyball as well as Joana and Luis for coaching. It was such a great weekend with some fantastic volleyball and the whole girls south west program all year has been so beneficial to me and all the other girls. This entry was posted in Coaching, Junior, News. Bookmark the permalink.